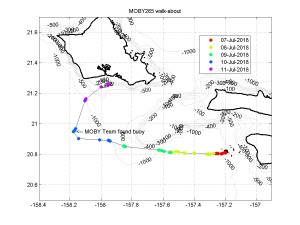 On Saturday (July 7th) at 10pm we got the email alert that MOBY265 had left the watch circle. It is now at lest 24 nm from the mooring. It has been confirmed that the mooring is still at the MOBY site. The MOBY team is working on getting a ship and divers to retrieve the buoy and tow it back to the mooring. Data acquisition has been turned off on July 8th. I will send another email when the buoy is retrieved and back at the site and data collection has resumed. 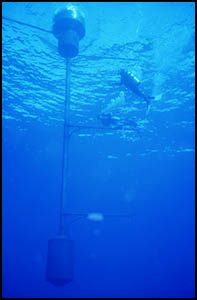 On July 10th in the morning the MOBY team found the buoy. It was too far from the MOBY site to tow it back so it was towed to the Pier 35 MOBY tent site and recovered at the dock.